Dr Laura Van Broekhoven will take up the directorship on 1 March 2016, following the retirement of Professor Mike O’Hanlon in September. Dr Van Broekhoven is currently Head of the Curatorial Department and Curator of Middle and South America at the Nationaal Museum van Wereldculturen (encompassing the Tropenmuseum, Volkenkunde and Afrika Museum) in the Netherlands and Assistant Professor of Archaeology at Leiden University. 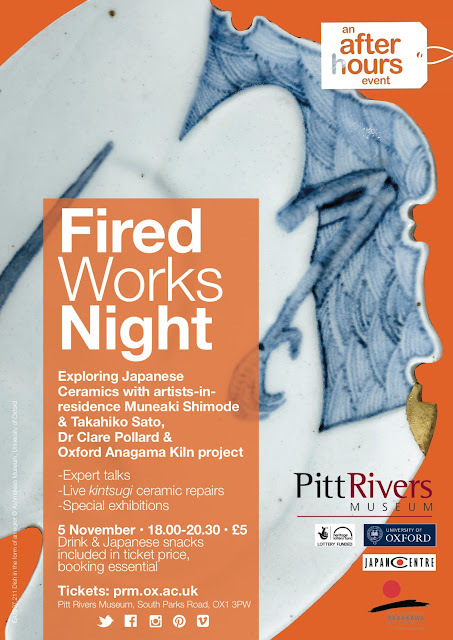 Professor Anne Trefethen, Pro-Vice-Chancellor for the Academic Services and University Collections at Oxford University, said: ‘I am delighted that Dr Van Broekhoven will be joining us at what is a pivotal moment, both for the Pitt Rivers for the University's other museums and collections. Over the past six months ACE SSN funding has enabled MEG to undertake a major scanning initiative on its archive, and I feel very fortunate to have been the person engaging with the historic and personal documents held within this resource. The archive was transferred from Liverpool Museum to Birmingham Museum and Art Gallery by Adam Jaffer and Jen Walklate earlier in 2015 and consists of ten boxes. I was tasked with scanning as much of the archive as possible over an allotted 100 hours. Over this time, I have been able to work through approximately 60% of the correspondence and documents contained within the archive, creating over 1,000 PDFs that span the almost 40 years of MEGs existence, from its founding documents to more recent additions. It soon became clear that I would not be able to scan everything, so I have focused on digitizing the older material, predominantly from the 1980s. The support of Birmingham Museum and Art Gallery has been key to this work as they provided desk space off their main archive room to install the scanner, and set up a laptop. 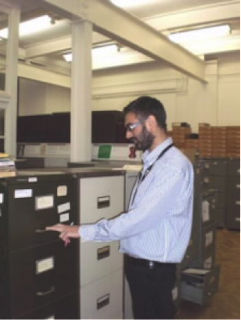 Curator Adam Jaffer has also negotiated for the loan of an empty filing cabinet for MEG to use, and in 2016 the MEG committee will decide on how to improve the current physical sorting by transferring some of the box contents to this cabinet. 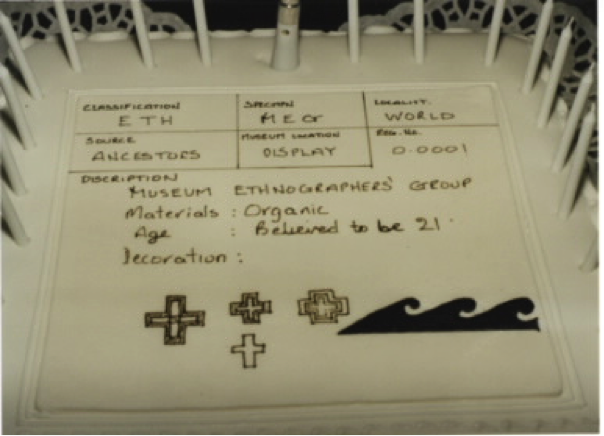 The archive contains evidence of the personal and business side of running MEG, and bears witness to the commitment of its members to ensure the group provides support for those working with and interested in anthropology and ethnography collections. 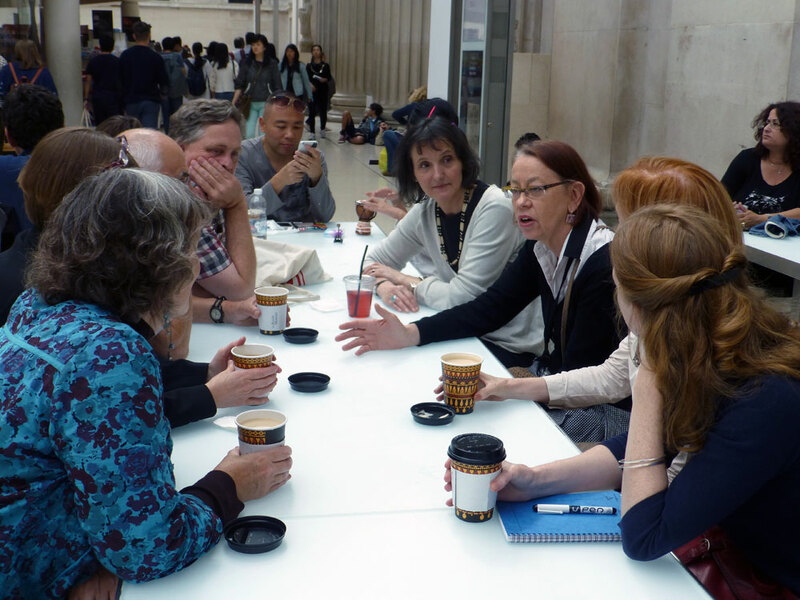 It provides examples of the kind of issues faced working with collections, from repatriation requests to necessary specialist advice, highlighting the important role of the group within wider academic and museum circles within the sector, and the important connections MEG has made and the opportunities it has responded to. The MEG committee is now debating how to improve the archive and would love there to be more photographs. Of the handful currently included several relate to the celebration of MEG’s 21st birthday in Manchester. See the photograph of the cake here (which sets the bar high for the 40th birthday cake in Manchester in 2016). If you are a MEG member, past or current, please do have a look in your work or personal photograph collections to see if any survive of MEG events or meetings. The current Chair of MEG, Antonia Lovelace, would love to hear from you. There are also only a few conference packs and contemporary brochures for museums that meetings took place at, and if you have been a lifelong member and have any of these old brochures these would also give context and colour to the typescripts of the meetings. MEG has agreed to support Claire Wintle at Brighton University, in her research project on ‘World Cultures Collections, UK Museums and Changing Britain, 1945-1980’. A bid has gone in to AHRC and the project is due to begin in October 2016. It will involve a close look at the MEG archive as well as interviews with key MEG member’s active in that period. Watch this space for news! More details on the MEG archive and its development will be presented at the Manchester conference and AGM, on 18-19 April 2016. Below is an example of a piece from the archive from 1974-5. 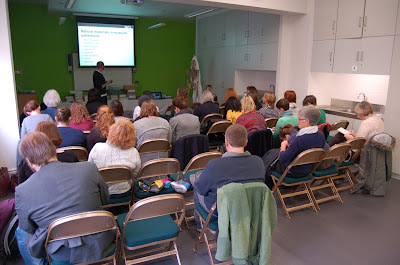 On Thursday 15th October, museum professionals and academics journeyed from far and wide (London and Derby!) to the Royal Albert Memorial Museum (RAMM) in Exeter for a workshop in identifying the natural materials museum objects are made from. The event, which was jointly run by the Natural Sciences Collection Association (NatSCA) and the Museum Ethnographers Group (MEG), was led by Paolo Viscardi, from the Slade Museum, UCL. The workshop was made accessible to all museum professionals and students who work with ethnographic and natural history collections but who don’t necessarily have a background in biological science. This free session was well attended and provided important breadth and depth information pertaining to the workshop’s theme of identifying claws, teeth, horn, ivory and bones. Paolo began the day explaining the relevant facts relating to existing CITES (the Convention on International Trade in Endangered Species of Wild Fauna and Flora) and HTA legislation, (Human Tissue Act) it helped to clarify the what-to-do scenario for museum professionals if they cared for items that needed to be registered, even licensed. This led to a discussion in how to correctly identify chemicals museum items may have been treated with, both for health and safety and for ethical reasons. With the help of comparative images and a vast array of practical examples from RAMM’s stores, Paolo illustrated the subtle but recognizable differences between the different types of materials. This even included a successful identification of one item that had been described in the original documentation as a ‘leopard tooth amulet’ that had been given to a military officer in northern Nigeria by a local chief who asked him to wear it because it would protect him from harm. This item did not have the expected curvature of a feline tooth but its straight shape, which was partly covered in leather, appeared to resemble the tooth of a crocodile! Another highlight of the day was solving the mysteriously labeled “rhino horn?” clubs in RAMM’s Ugandan collection. These two objects were unassuming plain batons topped with a heavy round head and appeared to resemble a dark wood. How does one discern wood from rhino horn? Producing a flashlight app on his phone, Paolo demonstrated that the best way to do this was to shine the light against the item. It was clear that the light could be seen glowing through the fibrous material, which confirmed both clubs as being made of this material. As a consequence the database has not only been updated but the artifacts are now in a more secure location; the theft of rhino and elephant horn from museum collections is unfortunately a sad reality. The workshop was a success and served as a practical introduction to material identification. Hopefully many attendees were inspired to return to their own collections with a refreshed and enriched perspective. What the session had highlighted was that training sessions such as this one was highly valued and that there was a need, especially for those who weren’t able to attend that day, for further sessions to be run. This MEG will do in 2016. The Sainsbury Research Unit for the Arts of Africa,Oceania and the Americas (SRU) is offering four scholarships for students enrolled in our distinctive MA course (2016/17). Study is highly flexible, can be tailored to students interests, and combines art-historical, anthropological and archaeological approaches, as well as study visits to UK and European museums. Candidates interested in careers in museum curatorship are especially welcome to apply. Free to all, with a great selection of expert speakers (including Oliver Watson) and also a range of handling sessions. To book a place please email. Please note that numbers are limited to approx 20, on a first come first served basis. The day is FREE of charge for SSN members and includes lunch. For details and a full programme please visit the website. The Pitt Rivers Museum is advertising for 3 posts to assist in relocation of their reserve collections. Links below. Further posts will become available for this project soon. You can find full details and job descriptions on the University website (see links below, or via the Pitt Rivers vacancies web page). Applications must be submitted via the University’s online application system (links are on the relevant web pages). The closing date for all of these jobs is 12 noon on Monday 23 November 2015. Team Leader - Pitt Rivers Museum Reserve Collections Move Project (one full-time post, grade 5). Project Assistant, Pitt Rivers Museum Reserve Collections Move Project (two full-time posts, grade 4). 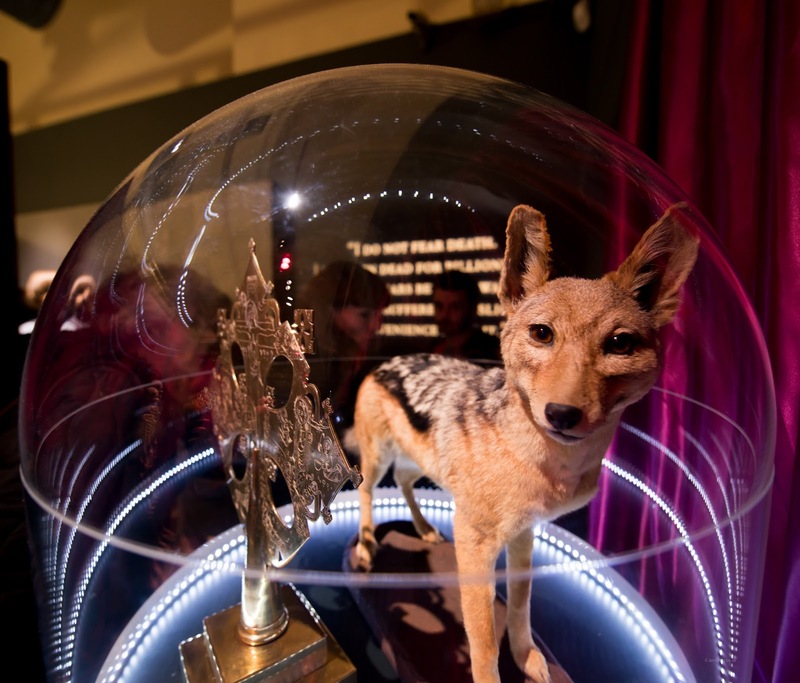 ‘Death: the human experience’, a new temporary exhibition, opened here last week at Bristol Museum and Art Gallery. Showcasing over 200 objects, a quarter of which came from our World Cultures collections, the exhibition is a cross-discipline, cross-cultural look at death and dying. Starting with the sumptuously eclectic ‘Symbols of death’ corridor, where we display everything from a Dia des los Muertos Catrina to an Ethiopian processional cross, you are led into the ‘Stages of Death’. This is the main central section that takes you along the journey from ‘Post-Mortem’, through containers, grave goods, funerals and on to mourning, memorialisation and connecting with the dead. World Cultures highlights in these sections include a loaned Paa Joe Ghanaian fantasy coffin, modern Peruvian grave goods, our beautiful Torres Strait Islander tortoiseshell mask and the stately Papua New Guinea Payback figures. Modern Peruvian grave goods and above, a view of exhibition, images copyright of Jon Craig. Other sections interrogate our modern Western attitudes to questions such as ‘When is death?’ by revealing the complexity of the issue when viewed by other cultures and religions across time. One of sections that has the highest concentration of ethnographic material is ‘Human Remains’. The quote ‘What will surive of us is love’ from Philip Larkin’s ‘An Arundel Tomb’, presented opposite a case of objects made wholly or partly from human remains, prompts us to consider what exactly we are looking at when we see an Ecuadorian tsantsa or a Naga trophy head. Incidentally having to apply for a HTA license in order to display material in this section of a questionable less than 100 year age has led to many conversations about the appropriateness of the inclusion of museums with ethnographic material within their remit. Funeral music from New Orleans and West Africa, and video of royal cremations and burials in Bali and New Zealand can be seen and heard in the exhibition, highlighting the huge global variety that exists in the way people around the world say goodbye to their dead. A video montage of different ‘death festivals’ from Bolivia’s Day of the Skulls to Madagascar’s ‘Famadihana’ or Turning of the Bones can be seen on the way out of the gallery emphasising not only the creative nature of humans in relation to death and the ancestors but also the celebratory approach present in non-Western responses to the subject. The exhibition touches on a variety of other areas such as assisted dying, Black Humour and attitudes to different types of death but fundamentally its big message - ‘Let’s talk about Death’ - is given weight and perspective by seeing how ‘others’ have framed death and dying in their own lives and how those societies have much to teach us about life itself. 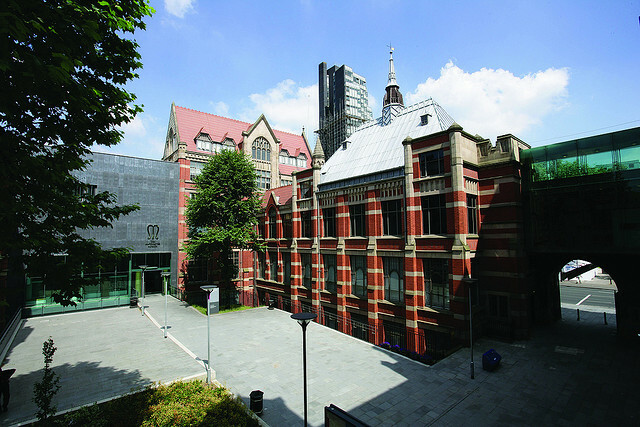 Manchester Museum is part of the University of Manchester and is internationally renowned for its encyclopaedic collections, innovative exhibitions, and extensive learning and engagement programme. The museum is critical to communicating the results of ground-breaking University of Manchester research, such research has informed exhibitions including Breed: The British and Their Dogs, Rapa Nui: The Statues from Easter Island and most recently Gifts for the Gods: Animal Mummies Revealed. This year it has initiated an exploration of South Asian collections across the museum, the Whitworth, and Manchester Art Gallery, collectively known as the Manchester Partnership, in preparation for several exciting forthcoming projects. A significant percentage of this material is linked to faith in South Asia and the South Asian diaspora, making the conference topic particularly relevant to this research. The conference will provide Manchester Museum with an invaluable opportunity to hear from other colleagues and organisations working in this area, we’re hoping for a diverse range of papers to stimulate debate and discussion. Manchester Museum actively encourages you to consider submitting a paper proposal and welcoming to Manchester in April 2016. 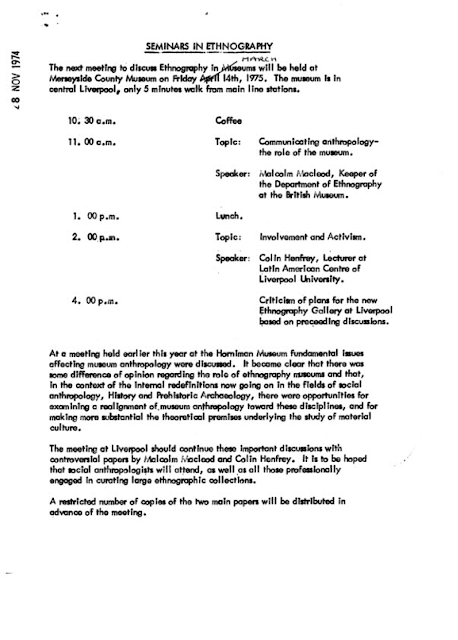 If you are interested in submitting a paper for the conference please send your title and draft abstract (c.100 words) to Stephen Welsh at Manchester Museum by 5pm on 12th February 2016. The biocultural objects and associated information collected by Richard Spruce in the Brazilian Amazon in the 1850s constitute a unique point of reference for the useful plants, ethnobotany, anthropology and environmental history of the region. This priceless collection, housed at RBG Kew and the British Museum, incorporates indigenous plant-based artefacts, samples of useful plant products, detailed archival notes on the use of plants by inhabitants of the Amazon, and accompanying herbarium voucher collections. These form part a larger body of 19th century material held in European collections, much of which has been poorly researched and is unavailable within Brazil. Such collections have huge potential as data for studies of Amazonian vegetation and ethnobotanical knowledge over the last 200 years, and provide a basis for analysis for future studies being conducted in Brazil. The talk will explore the nature and context of these objects and data in the context of Richard Spruce's remarkable explorations, and outline an emerging initiative to research, document and evaluate their value and significance in the context of past, present and future relationships between people and the Amazon forest. Dr William Milliken is a Research Leader at the Royal Botanic Gardens, Kew. His experience in the Brazilian Amazon, including ethnobotanical research with indigenous peoples and botanical exploration of remote areas, stretches back almost three decades. He is the author of several books on these subjects. I always find exploring other museum collections and meeting colleagues working in other institutions a rewarding experience. Julia Nicholson and I, both from the Collections Department at the Pitt Rivers Museum, recently visited the British Museum to see the temporary exhibition Indigenous Australia enduring civilisation. as part of a special tour of the exhibition, which included a talk by the Curator Gaye Sculthorpe, organised by MEG. We met up with the rest of the group from MEG, then Gaye gave an informative and interesting introductory talk before we looked at the exhibition. The British Museum collection was very impressive - including the work of contemporary Australian Indigenous artists, as well as older objects. The Pitt Rivers Museum, along with other institutions, had loaned some objects for the exhibition - which had plenty of visitors - so it was good to know people had this opportunity to see them on display. After a good look around we then met up again with Gaye, who had kindly set aside time to have an informal chat with us all after we'd looked around. Unfortunately the exhibition closed on 2 August, however, if you are interested you can still get a copy of Indigenous Australia: enduring civilisation, which was researched and written in conjunction with the exhibition. If you are in Australia, you will be pleased to hear part of the collection is travelling there for a temporary exhibition. Plus Gaye intends to continue to bring attention to the importance of the British Museum's Australian collections, which will involve working directly with Indigenous Australians. On behalf of Julia and I, I'd also like to say thank you to Gaye and MEG for this opportunity for such an insightful and enjoyable day. Any exhibition about Rapa Nui is inevitably going to be popular and challenging. How to satisfy a public who feel they ‘know’ the island’s most famous inhabitants – the iconic ‘Easter Island heads’ - when the statues themselves are inevitably out of reach on one of the most isolated inhabited islands in the world? This exhibition succeeds on two fronts. Significantly, the curators have been able to borrow the British Museum’s lesser-known, but still impressive statue Moai Hava (meaning ‘dirty statue’). This figure was brought to the UK by the crew of HMS Topaze in 1868, at the same as the British Museum’s famous moai: Hoa Hakananai’a. 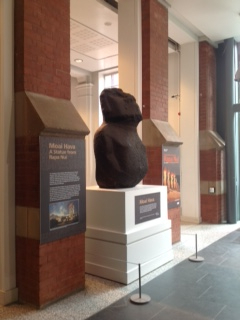 Raised up on a plinth in the entrance to the museum, Moai Hava ensures that visitors do not overlook the exhibition. Secondly, the exhibition includes two replica moai that impress, both in terms of their scale, and in the sense of drama created by the way one encounters them. The first part of the exhibition is contained in a small room which houses four display cases and a screen projecting large scale images of Rapa Nui and the statues in situ. While the images of the statues are striking, more remarkable are the beautiful views of the island’s landscapes: lush, green, rolling scenery and white beaches probably unfamiliar to those whose only experience of Easter Island is via representations of the moai in films such as Night at the Museum. This room introduces visitors to the Island’s geography, histories of encounter and the on-going fascination with the statues that has led to a myriad of cultural representations. Initially it seemed that this may be all there was for the visitor to see. A large curtain covered with images of Rapanui Rongo Rongo script tantalisingly suggested that there may be more to discover, but it required the encouragement of a museum attendant for most visitors to venture beyond. 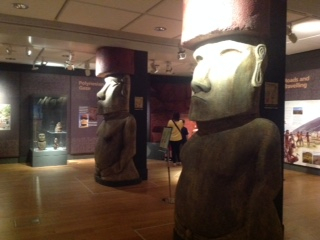 Stepping through the curtain brought one face to face with the replica moai. This moment of revelation, along with the decision to adorn the moai with red topknots and, in one case, to include the figure’s eyes ensured a ‘wow factor’ and the appreciation of visitors was audibly clear! Here, the exhibition discussed the latest interpretations of quarrying techniques, manufacturing processes and the way that Rapanui may have moved or ‘walked’ the moai. These texts were informatively and accessibly written and were the result of recent archaeological fieldwork carried out by members of the curatorial team. I was particularly impressed with the attention given to aspects of Rapanui cosmology, including many indigenous terms and concepts both in the gallery text and in the reasonably priced accompanying catalogue. One example was a discussion of the Polynesian realms of Ao and Po (light and dark or everyday and spiritual worlds). Indeed, the decision to separate the opening section of the exhibition from the darker space behind the curtain can be read as a clever visual manifestation of these concepts, and this intention was confirmed by a well-informed gallery attendant. My only disappointment was that some of the ethnographic pieces included in the exhibition were not displayed as well as they might have been. One case including a staff and two beautiful dance paddles seemed cluttered and poorly lit, making it hard to appreciate the objects. On the other hand, a display of stone adze blades, lit through a glass shelf to create a series of shadows on the case floor below, created a very pleasing effect. It’s a shame that this attention to detail was not applied consistently. In summary, Making Monuments is an excellent exhibition that succeeds in appealing to a range of audiences and no doubt has attracted visitor numbers to please the curators as well as the powers that be at Manchester Museum. Building on from a mapping programme the Islamic Art & Material Culture Subject Specialist Network (SSN). completed last year, the SSN are offering a specialist support scheme aims to provide regional museums with a toolkit to help them unlock the potential of their collections of Islamic Art and Material Culture and use them to engage with new and diverse audiences. It will provide flexible, specialist and practical support through a scalable programme that can be tailored to the needs of the individual institutions. At least one tangible output, such as a new display, knowledge sharing or outreach event should result from that specialist support. The deadline has been extended to receive applications for our Specialist Support Scheme. The deadline is 5pm on Friday 18th September, 2015. Three job opportunities for a major AHRC-funded project on Pacific barkcloth (tapa/kapa), starting in January 2016. The project is led by Frances Lennard at the Centre for Textile Conservation at the University of Glasgow, and is in collaboration with Adrienne Kaeppler (Smithsonian) and Mark Nesbitt (Kew Gardens), with a distinguished advisory board. Staff will be based in Glasgow but with travel to the partner institutions. The project combines research into tapa as a plant material with research into its history and cultural context. It is centred on the museum collections of the Hunterian, Kew and Smithsonian. Three posts are being advertised, closing date 20 September 2015. 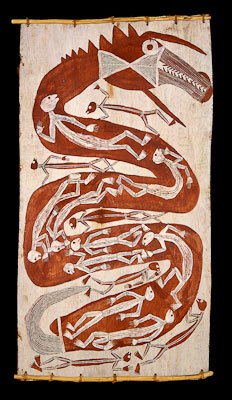 In the late nineteenth and early twentieth centuries, studies of ‘primitive’ and ‘tribal’ arts were closely identified with museums and collecting; when the field re-emerged in the early 1970s it was inspired by ethnography and new theorisations of symbolic systems but relatively unconnected with the vast collections of Oceania, African and native American art in the galleries and stores of ethnography museums in Europe and elsewhere. The lecture reflects on the constitution of collections, and in particular on the artefact, proposing that the museum, in dialogue with contemporary art, again has the capacity to constitute a ‘method’, to empower interpretations of art objects and cross-cultural art histories. Nicholas Thomas has written extensively on art, empire, and Pacific history, and curated exhibitions in Australia, New Zealand, and the UK, many in collaboration with contemporary artists. His early book, Entangled Objects (1991) influentially contributed to a revival of material culture studies; with Peter Brunt and other colleagues, he co-authored Art in Oceania: a new history (2012), which was awarded the Art Book Prize. Since 2006, he has been Director of the Museum of Archaeology and Anthropology in Cambridge, which was shortlisted for the Art Fund’s Museum of the Year Prize in 2013. A social anthropologist from Oxford University is collaborating with Japanese and UK potters in building and firing two traditional kilns in Wytham Woods near Oxford. Dr Robin Wilson, an associate researcher from the School of Anthropology and Museum Ethnography, is studying how a traditional craft can remain commercially successful in a modern global economy. The 11-metre-long anagama kiln, fashioned from willow and clay, was lit on the 11th August. To follow the project and find out more visit the University of Oxford news and events web page here. Museum staff caring for collections will understand how important it is to be able to identify the materials objects are made from. By working with colleagues across different fields of expertise, collections become accessible. Managing knowledge of related legislation ensures that collection management is done responsibly and ethically. 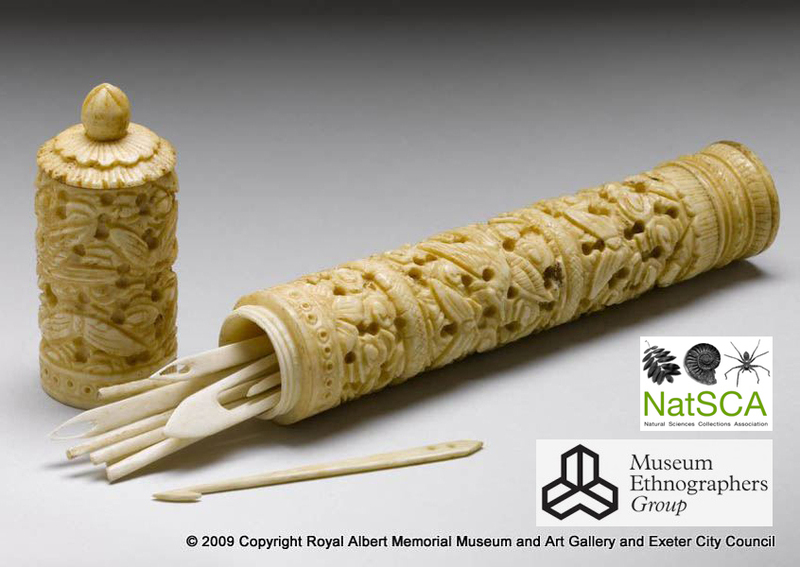 Historic items often employ ivory as a decorative element, but is it elephant ivory or walrus ivory? Do you know the difference between them? Items of jewellery and other items brought to the UK over 100 years ago were sometimes decorated with animal and human remains; bone, horn and teeth. But would you be able to identify them? This workshop will examine snake, fish and whale bone even the teeth of a wild cat and dogs. With anything made from bone one needs to be able to identify the species of animal, indeed it could even be human. With this in mind, museum staff should be aware of the current CITES and Human Tissue Act legislation. The workshop aims to provide museum professionals and students with an opportunity to learn how to identify raw materials and understand how current legislation can guide best practice in the museum environment.